Last week, people of color mobilized on social media to spread awareness of the alarming number of black and brown young women currently considered “critically missing” in Washington, D.C. The viral effort, along with sharing facts regarding the missing teens, encouraged others to question why cases about missing black women often go uncovered by the nightly news and other mainstream media sources. “As a society, we only pay attention when a particular type of woman goes missing,” artist Kenyatta A.C. Hinkle told The Huffington Post. For years, Hinkle has used her artistic practice to explore black female bodies ― how they navigate multiple geographies simultaneously and how they react to the narratives and perceptions thrust upon them. 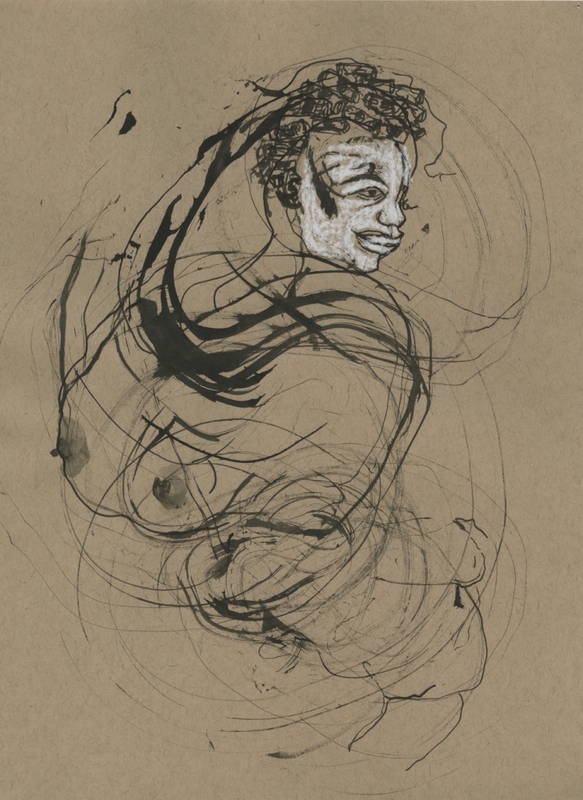 Her current exhibition, titled “The Evanesced,” features 100 drawings, which Hinkle describes as “un-portraits,” evoking black women who have gone missing, whose bodies and lives have been erased. Before “The Evanesced,” Hinkle created a series called “The Uninvited,” based upon 19th-century photographs of West African women taken by French colonialists. The images depicted their subjects monolithically and aggressively, propelling myths of black women as hypersexual and primitive, coercing their bodies into poses that fit the fantasy. The deeper the artist dug into her research, the more horrific the findings were. Hinkle claimed that in 2010, 64,000 missing black women remained unfound, citing a number that made its rounds on the internet in the years since; she described the number as “unfathomable, sublime.” When her peers learned she was researching missing black women, they shared stories of other cases and names. The black female bodies kept piling up. In her studio, Hinkle lined up pieces of blank, recycled paper. She then turned on music ― Billie Holiday, Sarah Vaughan and Kanye West’s “Life of Pablo” were favorites ― and began to dance. The gestural figures that emerged from Hinkle’s body and subconscious mind look like apparitions as much as real people, their trembling bodily outlines giving way to ink-stained abstraction. The black lines veer from fine and airy to coarse and wet, resembling rays of spirit from one angle, bodily scars from another. Some women dance, some braid hair, some curl up in a ball as if cowering in fear. In his review for The Los Angeles Times, Christopher Knight likened Hinkle’s minimalist style to that of 20th-century Austrian artist Egon Schiele. The mythic woodcut prints of Alison Saaralso come to mind, as do the ghostly drawings of Alina Szapocznikow.